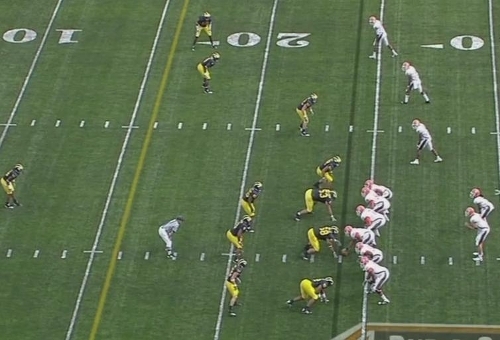 Michigan is in their typical 3-3-5 stack against a trips look for Bowling Green. Michigan is going to rush their three down linemen as well as Craig Roh from his linebacker spot (the stand up defender on the line of scrimmage). They will drop the other seven players into zone coverage. Bowling Green has called a designed roll out to the strong side of the field. 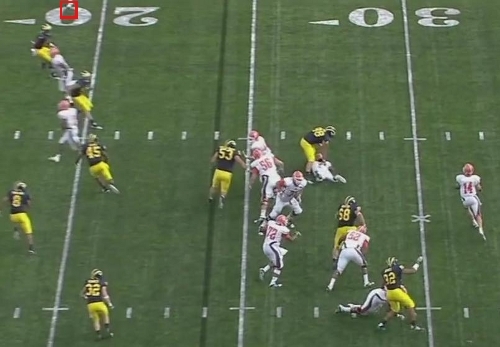 After the snap, you can see the Michigan rush as well as the zone coverage. Michigan will drop into a cover-2 look here with JT Floyd playing the deep weakside of the field and James Rogers (top of the screen) playing the deep strongside of the field. The linebackers, Cam Gordon, and Jordan Kovacs will all drop into underneath zones. This is where the trouble starts on the play. Highlighted in red is James Rogers whose job it is not to get beaten deep. With three Bowling Green defenders streaking downfield (the third receiver is partially cut off at the top of the screen), Rogers starts heading deep. Highlighted in blue is Cameron Gordon. As the widest underneath defender, it's Gordon's job to defend the boundary. Kevin Leach is the playside linebacker and is between Bowling Green's two inside receivers. Ezeh is trying to get over to the playside of the field to defend. 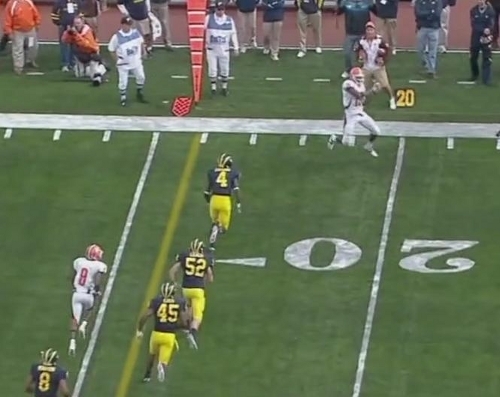 Since he's not there yet, Michigan essentially has two defenders (Gordon and Leach) against three receivers. The ball is highlighted in red and is headed toward the outside receiver who has about 10 yards of space between he and Gordon. Rogers still has coverage over the top, so that's definitely not his responsibility. 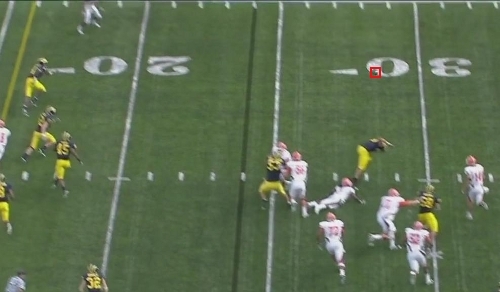 Michigan has three players (Gordon, Leach, and Ezeh) within five yards of one another when the ball is released. When the receiver catches the ball, Gordon is still three to five yards away from him. Leach and Ezeh are in pursuit but it feels like Gordon was out of position on this play. Otherwise, Ezeh and Leach would be further behind him. Gordon eventually makes the tackle but only after an easy seven yards for Bowling Green. As I said above, I don't really know whose at fault here. It's definitely not Rogers who was playing the deep half of the field. I'm inclined to say it was Gordon's fault for not covering the boundary, but then again, Ezeh's late rotation (not entirely his fault, he got off the snap quickly and just had a lot of ground to cover) seemed to necessitate Leach covering the inside receiver through his zone and Gordon shading over to the middle receiver. UMass torched Michigan on this same play repeatedly and I have no doubt that other teams will as well. And as Michigan faces more talented quarterbacks through the Big Ten schedule, this looks to be the team's Achilles' heel. 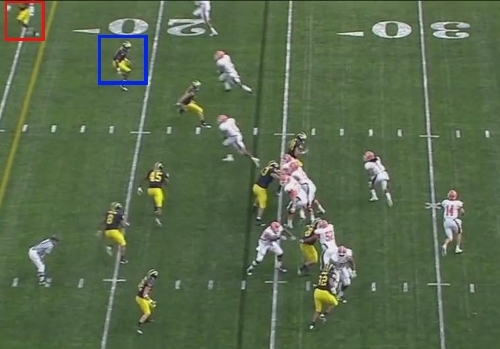 The nickel package that Greg Robinson debuted in the Bowling Green game is one way to remedy this problem. 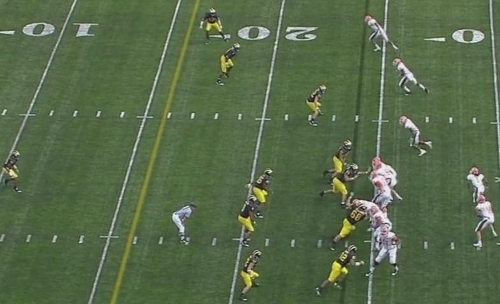 Without gaping holes in the zone coverage, Bowling Green doesn't get this easy completion. Having man coverage here probably necessitates three vertical routes with two over-the-top defenders in Floyd and Rogers. I'd prefer this over pitch-and-catch completions, but Robinson is probably worried about the deep ball more. This is bend don't break football.